डिज़्नी confessions. . Wallpaper and background images in the American Dragon: Jake Long club tagged: american jake long dragon mjfan4life007 disney. This American Dragon: Jake Long fan art contains मोबाइल फोनों के लिए, हास्य पुस्तक, मंगा, कार्टून, एनीमे, कॉमिक बुक, and manga. 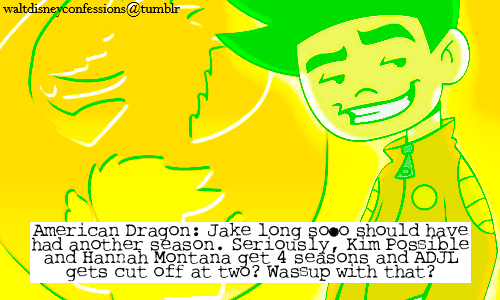 Maybe it's bcuz everyone thinks Jake Long is STUPID! That's what everyone one at my school said. I hated that! Ya, I hate that people say it's stupid it's actiually pretty good.